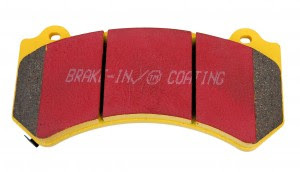 More R35 GT-R Brake Pad options. EBC Yellowstuff pads for the Nissan GT-R R35 are now available from EBC Brakes in their High Friction Yellowstuff DM 1793 formulation. Yellowstuff is an aramid fibre based brake compound with high brake effect form cold and is possibly one of the first ever compounds that can be used for STREET AND TRACK DRIVING. These pads do not require warm up and get stronger under the heat of hard driving. The front pads part number DP41983R and rear pads carry part number DP41110R. With the price will be significantly below the Nissan price and most other aftermarket suppliers we think they will be on every GTR divers shopping list. Prices and product online shortly.